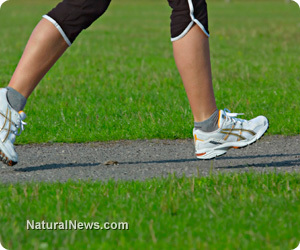 (NaturalNews) Walking is one the most preferred ways to lose weight and stay in shape. It's natural, it's free, and it's effective. Some people try to enhance their walking workouts with exercise accessories and following certain guidelines. There are ways to boost your walking workouts so that you burn more calories, but there are definitely tricks you shouldn't try. Learn safe methods to get the most of your workouts with this list of dos and don'ts. Back in the 80s everyone had crazy clothes and insane ideas about exercise. A common thing to see in an aerobics class or on the streets were people swinging dumbbells around or wearing ankle weights in hopes to burn more calories. It didn't matter how uncomfortable or silly they looked, uncomfortable and silly were the status quo in the 80s. Music and movies from the 80s thankfully survived the test of time, but unfortunately so did some exercise ideas.